When I’m getting ready for class, I’m all about simplicity. I like to dress a little bit nicer than the stereotypical college uniform of a giant T-shirt and Nike shorts, but I’m also not wearing anything super-stylish either. My makeup routine for class is a pretty reasonable complement to that. Also, I promise this title isn’t just clickbait – I’ve actually timed my makeup routine in the mornings and it falls just shy of 5 minutes. In the pursuit of a lighter coverage foundation, I stumbled upon this IT Cosmetics CC Cream, and let me tell you, it’s amazing. It manages to even out my skin but somehow feel like I’m not wearing anything at all. Also, one pump is enough for your whole face. The first step of my makeup routine is putting this stuff all over my face with a BeautyBlender (or a plain ol’ foundation brush if I’m doing my makeup on the go and can’t get my BeautyBlender wet). I use 5 products total in this routine, and 3/5 of them are Glossier products. I discovered Glossier earlier this semester, and I am such a fan. 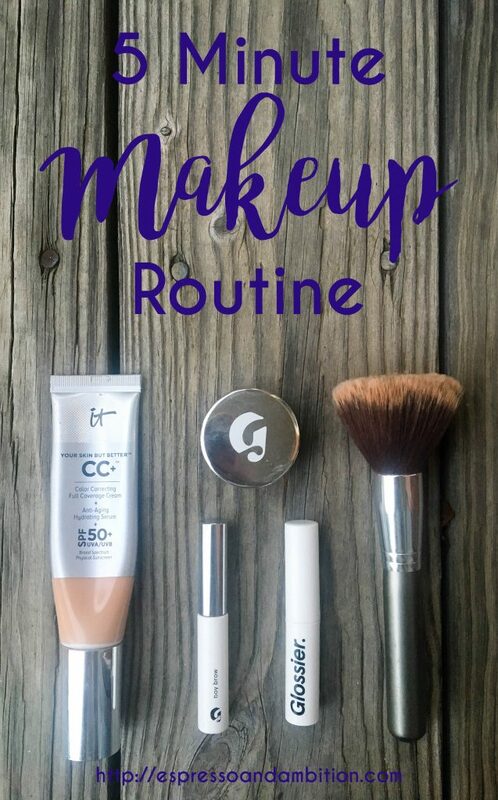 So many of their products are focused on simplicity, so they fit in perfectly with this low-maintenance makeup routine. First up is the concealer, which I use both under my eyes and on any blemishes. Despite being stored in a pot, this stuff is so creamy and blends really well. This step is kind of optional, but I like to put a thin layer of translucent powder on my face. I have naturally oily skin, so a little bit of powder goes a long way in making sure I don’t look ridiculously greasy by the end of the day. As much as I love this product, I’m not a fan of the sheer number of times I’ve spilled a ton of light-colored powder down the front of my dark-colored shirt. That’s not a complaint about the product, that’s a complaint about my ability to apply it in a neat fashion. Since I get my lashes lifted/tinted once every other month, I don’t wear eye makeup on a daily basis. The only thing I use on my eye area is a clear brow gel, because my eyebrows have a mind of their own. Once again, I’m using a Glossier product for this – I’ve found that this brow gel doesn’t make my eyebrows super stiff, which is a problem I’ve had with other products. For some reason, my natural lip color makes me feel like part of my face is missing. I really think it’s because I wear so much dark lipstick that I’m unaccustomed to the idea of my face without it. I’m a red lipstick gal at heart, so red tinted lip balm is the perfect everyday option. And that’s all there is to it! Five minutes later, and you’re out the door. Happy Friday, y’all! Ahh, Glossier’s boy brow is seriously my favorite thing ever! !